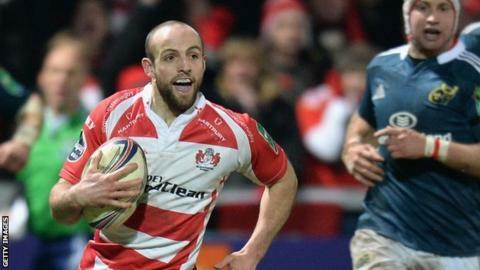 Gloucester pair Tom Savage and Charlie Sharples have agreed new long-term contracts at Kingsholm. Forward Savage, 26, began his professional career at Gloucester and has made 67 Premiership appearances. Winger Sharples has four England caps and has played 173 games for the Cherry and Whites, scoring 64 tries. "I'm incredibly happy, I've been with Gloucester my whole career and didn't have any intention of looking elsewhere," the 25-year-old said. Sharples is one of Gloucester's most potent attacking weapons, and last season marked his 150th competitive appearances with a hat-trick of tries against Brive. "Players often say that it's a relief to get things sorted early when it's a contract year, and that's absolutely true," he added. "It's a real boost to know that the club wanted to get it all done and dusted, and I can focus 100% on the rugby now without worrying about anything else."